Here's an easy to listen to collection of adult contemporary/new age instrumental tunes performed by an ensemble, fronted by guitarist Roy Scoutz (who also did the arrangements and played keyboards, bass, mandolin, percussion, and lap steel). Being familiar with Scoutz's solo releases, I was not surprised by the quality of music on Heaven and Earth nor by the CD's variety, featuring smooth rocking tunes, such as the opening "The Way of the Fox," or the gentle haunting ballad "Celtic Prayer." However, I was caught somewhat unawares by the rural rave-ups like "Mountain Magic" which shakes the barn rafters thanks to spirited interplay between Scoutz and Erin Zindle's violin. This is followed by an even more uptempo piece, "Barn Red Blue Grass," another cut that features the guitarist mixing it up with other accompanists. They really cut a rug on this toe-tapper. However, not everything on the CD is happy-go-lucky, as the next track demonstrates. "It's Lonely Here On The Moon Blues" is a languid bluesy ('natch) cut that unwinds at a leisurely pace but still offers up some tasty fretwork. As with his solo efforts, Scoutz's proficiency on electronic keyboard fills is amply displayed. This guy really knows his way around a mixing board so that those synths provide just enough texture without either submerging or overpowering the main instruments. A lot of the album has more of a countryside/rural feel to it, but the music is so professionally played and recorded that I hesitate to stress this too much, lest you think you'll be getting a Flatt and Scruggs record! Still, Heaven and Earth would play better as the soundtrack for motoring down a two-lane blacktop, past cornfields and hills speckled with dairy cattle than speeding through concrete canyons or neon-lit cityscapes. It's just that kind of "natural" sounding music. Bouncy tunes like "Train to Sanctuary" provide a nice musical "ticket" for relaxed cruising, while quieter fare, such as the gentle "Epoch Sunset" allow for a change of pace (maybe as the sky darkens and lights wink on in farmhouses in the distance). Heaven and Earth would please fans of any number of AC or new age music guitarists, provided they're not looking for a more introspective Will Ackerman affair, but instead something along the lines of Jamie Bonk, Ken Bonfield, Eric Tingstad, or similar artists. I enjoyed the album every time I played it (especially on headphones where the mix and production really shines) and recommend it, upping that to a "highly recommended" for those aforementioned drives through the country. 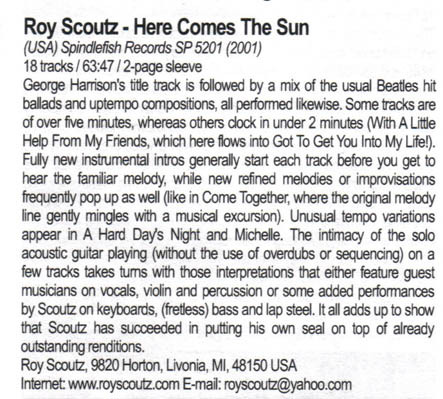 Roy Scoutz is a talented acoustic guitar player and multi-instrumentalist whom I first reviewed a few years ago (Autumn's Whisper). Recently, he sent me two newer recordings and this is the first one I'm reviewing. My Father's Garden lands somewhere on the spectrum between smooth jazz and new age, comparable (to some degree) to Jamie Bonk, although Scoutz's music rocks a little less and sways a little more. 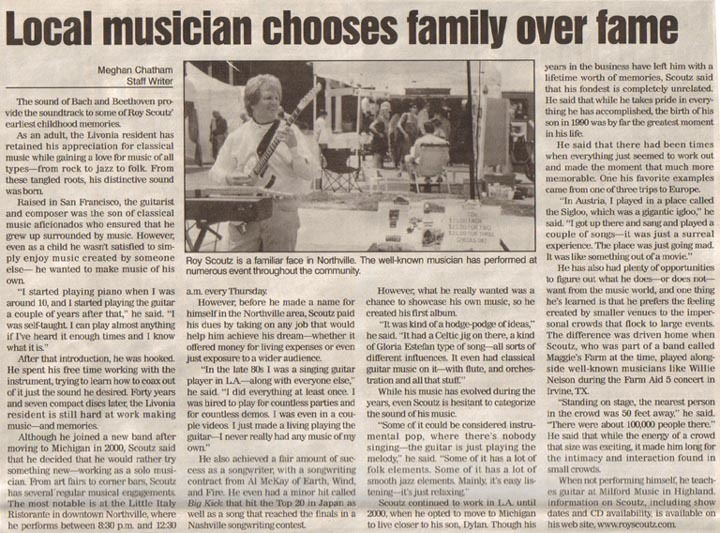 My Father's Garden features him on acoustic guitar, lap steel guitar and percussion (per his website). There are backing keyboards on some tracks as well (tastefully applied), as well as some indistinct vocals on one track. There are also sparse nature sounds here and there too (such as falling rain at the start of "Bamboo Moons"). Scoutz's demonstrates impressive talent on his assorted instruments. His lap steel playing adds an unusual dimension to some songs, although it may take a little getting used to since the instrument's normal connotation is to country and western music. The juxtaposition on, e.g., "Bamboo Moons" where the lap steel is counter-pointed by Asian music textures, is unexpected and daring. Most of the selections on My Father's Garden are mellow and laid-back affairs, although tempos can vary. "Back Home Again" (opening with pealing pedal steel and plaintive acoustic picking set against a bubbling brook) eventually picks up steam and asserts itself with a friendly but steady midtempo cadence to the rhythm and lead guitars. "Prayer for the World" is more of a smooth jazz tune with its sultry yet gentle rhythms and soft sense of rolling (imagine Earl Klugh without any funk). Without any horns in the mix, this kind of jazz has a stronger rural feel to it, lacking (as intended) an urban sensibility. "The Rainmaker" (opening with a rainstorm, of course) offers a charmingly soft intro passage and then unfolds into a mildly dramatic song, with some jazzy runs on digital piano, thumping bass, and catchy percussion. "Chautauqua Sunset" is, as you'd imagine, a soft number, this time with flute performing in a duet with some graceful acoustic guitar and piano adding subtle embellishments here and there. "Morning Trail" is one of the sprightlier tracks on the CD, and it starts out that way rather than building. Lively trap kit rhythms, mildly funky rhythm guitar and some solid lead picking bring comparisons to Bruce BecVar to my mind or the earlier mentioned Jamie Bonk. Jazzier electrified soloing later in the cut lends a "sunny day" atmosphere to the tune. The only criticism I would make of this fine album is song length. The mean average for a track is six minutes and, for this genre, that's a tad too long for me. Some of these songs, as pleasant and enjoyable as they are, seem to stretch on past their optimal point. This is not a major complaint, and if you're playing this as background music during activity or while driving, I suspect it won't be an issue. However, it bears mentioning if you are (as I am) sitting and listening to it intently. Just the same, for easygoing music that lands somewhere between "kick up your heels" and "kick back and relax," My Father's Garden hits way more than it misses. Smooth jazz fans who don't need the oomph of heavy bass or the wail of a saxophone or trumpet, as well as lovers of upbeat acoustic guitar new age music (this is not Peter Janson or Will Ackerman territory, but more like Bradley Powell, a.k.a. The Candlelight Guitarist or Lynn Patrick) should have an entertaining time with this release. Recommended. We have placed Roy's CDs into our family room jukebox. My house was filled with peace as we listen to his creative expression. There is suddenly and air of cooperation in my house. His music has shed another dimension into our lives! My Fathers Garden will transport you to a sunset balcony overlooking the fishing boats of Barcelone, Spain. A humble monastery of monks high in the Himalayas. Sublime and thought-provoking music that takes you from solemn joy to colorful images of a desperate soul, seeking answers by turning within while unknowingly being transported by the sounds escaping from My Fathers Garden is a purely delightful journey. "Here Comes The Sun" Pure Guitar genius on this one.Iam sure that Paul, George, John and Ringo would give Roy Scoutz 4 thumbs up. They may also ask how Roy plays so many parts of these songs on one guitar. Truly, my favorite disc to wear out for a long time. Can't be without a copy in your collection. 10 stars for this remarkable disc. When the sun is just beginning to rise for a new day and the moonlit shadows of night are reluctantly evaporating, From a Blue Sky is the cd in my bathroom player to ease me into a new day while I shower. An extremely gentle creation to take the edge off things in a rat race world! We have listened to all of Roys CDs and this one has become our favorite. There is variety on the moods from very relaxing to light smooth jazz. The melodies are always inspired and tuneful. Our favorite track is "Prayer for the World". Very nice art work as well. After listening to this CD collection of Beatles songs I was almost overwhelmed. Not because the playing was so beautiful for it was indeed performed very well but it was so tasteful and musically innovative. Come Together and Across The Universe were two of my big favorites but in saying that I loved alot of them. A great disc of great tunes from a wonderful Guitarist. highly recommended. Both Of these discs are excellent. They are filled with extremely beautiful and interesting music.They are perfect for my Radio program.I will definitley keep spreading the word amongst my listeners and will feature this artist often. The CD has an over gentle feel which is perfect for mellow moods. There are some very beautiful songs that cross over between New Age,Smooth Jazz, Classical and Pop.As always the Guitar playing and arrangements are suburb and Roy even plays some uplifting piano solos. An inspired musical journey from start to finish. If you loved "Autumns Whisper" you will also enjoy this disc. I really enjoyed this CD. The Playing is Excellent and the arrangements are very intelligent. I also liked the tasteful backing on many if the tracks. My personal favorite was Eleanor Rigby. A great job. hear this Cd someday and enjoy again these great songs in a new and exciting way. This new collection of Beatles tunes is Wonderful. A true gem from an amazing talent. out or better yet Hear Roy play live! listened to many recordings that are Beatles related. depth to a simple production. hands of a great Artist. Last summer we purchased both CDs and we have enjoyed them very much. We love the soothing effect Of Roy's music and are looking forward to his next release. Don,t pass up a chance to hear Roy live! His music and playing are both masterful. Beautiful easy listenin' music. I play it frequently on a new music system throughout my home. It's really a good listen after a hard day's work! If you like soothing music with beautiful melodies you should listen to Autumn's Whisper. I enjoy listening to Roy's CD when I want to unwind from a long week at work. Many of my friends have the CD and they also find the music to be relaxing. If you get some time you should check out a live show. He is a wonderful guitar player and excellent performer. Iam a massage therapist and have used Roys CD as a relaxing Soundtrack. I have recieved many compliments and I highly recommend it. This wonderful CD features excellent performances highlighted by an expert production. World Cafe offers a variety of instrumental styles and combinations unified by good feelings and strong compositions. At the signpost up ahead, next stop, the Scoutz Zone. A place where classical guitar govottes around a new age maypole, Scoutz' Neo Classical< fingerpicking on "Varations on the Mozart Requiem" and Especially on "Last Night In Vienna" where tastefully accompanied by Flute are restful and evocative. "Glory Glory" is far more direct in the fusion camp all percussion and sythesisers voluptuously swelling around the beautiful, yet, simple guitar melody. Some really enjoyable music here. I especially like the first four tunes, which feature more instruments than the second half of the CD. This probably says more about my personal preference than the music, which is consistently original and full of heart. Suite: Olivia is my favorite cut. Makes me feel like I'm in a romantic European movie. A very romantic, well orchestrated collection of contemporary guitar music. It seems to send one away to the wine country of Southern California with the whimscial, magicial medleys. Or you can dream by the fire with someone special while listening to the sounds of Birdhouse. The only comment I have is that I would have liked to have heard more vocals from Roy, otherwise a most enjoyable listening experience. Acoustic guitar-based melodies are fairly common in new age music. Much rarer are those artists who both compose and play original music that transcends the ordinary. Roy scoutz falls squarely into that category of musicians. On Autumns Whisper delicious melodies combine with percussion to help listeners float away from everyday worries. Scoutz is first and foremost, a guitar wizard playing all the guitars as well as mandolin and lap steel. He also handles keyboards and piano showcasing his prodigious talent on all these instruments. Scout composes contempory instrumental jewels that shine with gentle celebratory fire. For sheer beauty and inspiring music, let Autumns Whisper tickle your ear.